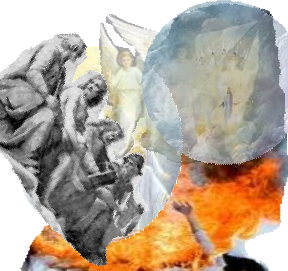 Although it is generally believed that the whore’s judgment will take place during the seventh plague of Revelation 16:17, 19, our exploration of chapter 17 (especially verse 16) suggests it will take place during the second trumpet scenario of Revelation 8:8,9 when “a great mountain burning with fire [is] cast into the sea”! Now, here in this chapter, John first begins with another retrospective look back to a marvelous probationary event that took place a short time just before the judgment of “the woman . . . that great city, which reigneth over the kings of the earth” (Revelation 17:18) took place. Verse 1: And after these things I saw another angel come down from heaven, having great power; and the earth was lightened with his glory. Interestingly, an “angel (singular)” is mentioned more than fifty times in the book of Revelation! 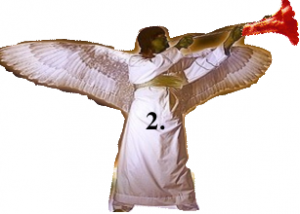 In order to determine which is other “angel” is, we must refer to the context. All the other angels from Rev.14:15 to this verse are depicted in a post-probationary context. The the previous angels portrayed in a probationary setting are the three in Rev.14:6, 8 and 9. Lets see if that makes sense. The previous “angel” of chapter 17 who revealed the whore’s doom, had “seven vials” full of God’s destructive “wrath” that were poured out in judgment of the whole earth during the “third woe” or “seven last plagues” depicted of chapter 16. Those plagues took place sometime after the “great whore” had been made ”desolate,” striped “naked,” her “flesh” eaten then burned “with fire” in Revelation 17:16. That atrocity was committed by the “ten [pagan] kings” who had given “their power and strength unto the beast” instead of the “woman” (Revelation 17:12, 13). That is the time when God “will give power unto [His] two witnesses” (Revelation 11:3) while Jesus is still in the most holy place of the heavenly sanctuary who “came and took the book out of the right hand of” God (Revelation 5:7) at the beginning of the Investigative Judgment of the dead. But, by now, the judgment of the dead has passed from the dead to the living because the 144,000, whose work is represented by this fourth angel, will have already passed through the “fifth seal” test of Revelation 6:9-11 and been sealed with the seal of the living God (Revelation 7:2,3) and are seen in Revelation 14:1 with their “Father’s name written in their foreheads. The work of this angel is the same as the three angels of Revelation 14 and also the other “angel ascending from the east, having the seal of the living God” (Revelation 7:2) and empowering “the kings of the east” (Revelation 16:12) to bear the “tidings out of the east . . .” that infuriates the “vile person” (Daniel 11:44; 21). Furthermore, as just stated above, the “great power” of this angel is the same “power” given the “two witnesses” of Rev.11:3. That was when the “holy city” (Revelation 11:2,3) called the “true church” on earth but dwells in heaven spiritually, is trampled “under foot” by the “Gentiles” who reside on earth (in the spiritual as well as the literal sense). The trampling took place in “the court which is without the temple of God” during the time when the “vile person . . . . shall have accomplished to scatter the power of the holy people” (Daniel 11:21; 12:7) by means of “the abomination that maketh desolate” (Dan.11:31; 12:11) which is the “beast, image” and “mark” of Rev.13:11-17. Verse 2: And he cried mightily with a strong voice, saying, Babylon the great is fallen, is fallen, and is become the habitation of devils, and the hold of every foul spirit, and a cage of every unclean and hateful bird. Note the similarity of this message to that of the second angel of Revelation 14:8 who said “Babylon is fallen, is fallen, that great city, because she made all nations drink of the wine of the wrath of her fornication.” Now, because of her refusal to repent of her crimes and admit to the “nations” that she has been lying to them, she has descended down about as far as she can go into the depths of degradation. In this final stage of her fall, she is seen greedily housing “devils” and coveting “every foul spirit” even treasuring “every unclean and hateful bird” as if fearful they would somehow be taken from her! Evidently, her corruption is not only complete, it is irreversible. Although chapter 17 focuses on the catastrophic event that will befall Vatican city, also called “BABYLON THE GREAT” in verse 5, “This scripture, from the point of view retrospective to Rev.17, points forward to a time when the announcement of the fall of Babylon, as made by the second angel of Revelation 14 (verse 8), is to be repeated. 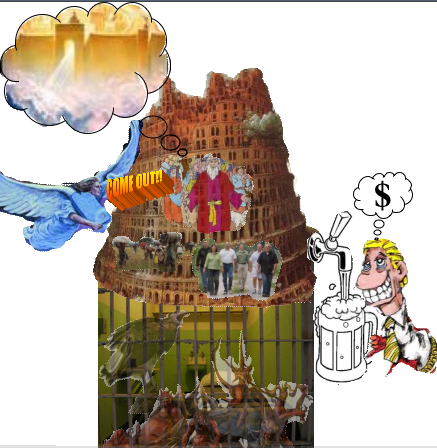 [Here], additional mention of the corruptions which have been enterring the various organizations that constitute Babylon since that message was first given in the summer of 1844″ is pointed out in graphic detail. 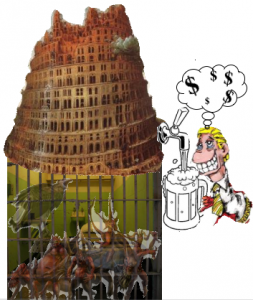 Therefore, while chapter 17 focuses on Vatican city, this chapter begins with the the problems of the Babylonian system as a whole illustrated by this picture of the tower of Babel mounted atop a prison housing disgusting creatures. “The second angel’s message of Revelation 14, was first preached in the summer of 1844, and it then had a more direct application to the churches of the United States, where the warning of the Judgment had been most widely proclaimed and most generally rejected, and where the declension in the churches had been most rapid. But the message of the second angel did not reach its complete fulfillment in 1844. The churches then experienced a moral fall, in consequence of their refusal of the light of the Advent message; but that fall was not complete. As they have continued to reject the special truths for this time, they have fallen lower and lower. Not yet, however, can it be said that ‘Babylon is fallen, . . . because she made all nations drink of the wine of the wrath of her fornication.’ She has not yet made all nations do this. The spirit of world-conforming and indifference to the testing truths for our time exists and has been gaining ground in churches of the Protestant faith in all the countries of Christendom; and these churches are included in the solemn and terrible denunciation of the second angel. But the work of apostasy has not yet reached its culmination. At this point, it seems impossible to overemphasize the importance of its future application, especially in consideration of its context. Among other things, review the “drunken” condition of the “woman” of chapter 17, the three way division of “great Babylon” in chapter 16 when “the great river Euphrates . . . was dried up,” “the temple” in heaven being “filled with smoke” in chapter 15, “one like unto the Son of man” sitting on “a white cloud” instead of the “temple” in chapter 14, the economic boycott depicted in chapter 13, the dragon’s wrath with “the remnant of” the good woman’s “seed” in chapter 12 and even the time when the “two witnesses” are given “power” to “prophesy a thousand two hundred and threescore days, clothed in sackcloth” in chapter 11. There, the pen of inspiration invites us to “Read every verse [of chapter 11], and learn the things that are yet to take place in the cities. Read also the scenes portrayed in the eighteenth chapter of the same book.” That statement brings us full circle back to chapter 18. 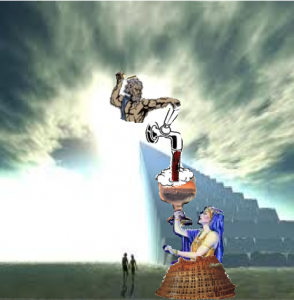 Although the message of this fourth “angel” will be given during probationary time, Babylon, by that time, will have fallen into its own “bottomless pit.” It, as an organization, will have committed the unpardonable sin by causing “as many as would not worship the image of the beast should be killed.” On a massive scale innocent people who refused to worship “the beast, neither his image, neither had received his mark . . .” will be “beheaded” (Revelation 20:4) causing the “great whore” to become “drunken with the blood of the saints, and with the blood of the martyrs of Jesus” (Revelation 17:6). In that case, the devil will have her in total control. Verse 3: For all nations have drunk of the wine of the wrath of her fornication, and the kings of the earth have committed fornication with her, and the merchants of the earth are waxed rich through the abundance of her delicacies. In Revelation 14:8 “she made [or forced] all nations drink,” here they “have drunk” (past tense) suggesting the last stage of apostasy has been reached. 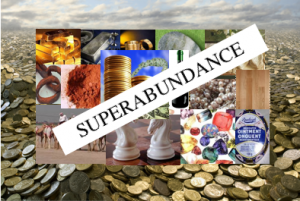 In addition to the message of the second angel, this “fourth angel” gives special warning, not only against “the kings of the earth, but against “the merchants of the earth,” who by this time will have “waxed rich through the [super] abundance of [Babylon’s] delicacies.” Those “delicacies” are represented by the metaphoric “flood” of false doctrine the “vile person” of Daniel 11:21,22 used to overwhelm all who stood “before him” and the “flood” “cast out” of the “mouth” of the “serpent” against God’s church in Revelation 12:15 whose agent in this context is Babylon. But, of course, she does not do this unless there is something in it for her. Therefore, she enters into this transaction in order to induce the “merchants” into committing something they would not ordinarily do unless they were desperate. Consequently, they must consider what she wants is immoral, which the Bible calls: “fornication.” This is symbolic “fornication.” And because it concerns a transaction between Babylonian and the “merchants,” it must be some kind of an immoral business deal with great profit, not only benefiting the “merchants,” but making it possible for the “woman” to become “drunken with the blood of the saints, and with the blood of the martyrs of Jesus” (Revelation 17:6). Verse 4: And I heard another voice from heaven, saying, Come out of her, my people, that ye be not partakers of her sins, and that ye receive not of her plagues. If the other “angel. . . . from heaven” of verse 1 was the “fourth angel,” this is the fifth. His message is very encouraging. Since the pronoun “her” refers to “Babylon the great,” and this heavenly “voice” calling His “people” who are still in Babylon to “Come out” suggests that there is still great hope for those people. In fact, “Notwithstanding the spiritual darkness, and alienation from God, that exist in the churches which constitute Babylon, the great body of Christ’s true followers are still to be found in their communion.” Undoubtedly, that “great body” is the “great multitude, which no man could number, of all nations and kindreds, and people, and tongues . . .” (Revelation 7:9). They responded to the “tidings out of the east” (Daniel 11:44) proclaimed by the “kings of the east” (Revelation 16:12) also represented by the “two candlesticks” with fuel from the “two olive trees” shedding the light from the Old and New Testaments to “prophesy a thousand two hundred and threescore days, clothed in sackcloth” (Revelation 11:3,4). Although “the punishment of Babylon, the united apostate religious organizations of the earth, takes place under the seventh plague,” the judgment of “Babylon the great,” namely Vatican city, precedes the plagues as we shall soon see. But, none of these plagues, be they trumpet or vial, are intended to terrify the unbeliever into complying with the invitation because they do not come until after the close of probation when true compliance is no longer possible. During the probationary time of the loud cry, God calls upon the responders to exercise faith that the warning is a valid call from God just as Noah’s warning to the antediluvians to enter the ark even though the sun was shining. Verse 5: For her sins have reached unto heaven, and God hath remembered her iniquities. Here, “The sins of Babylon are depicted as a mountainous mass reaching upward, compact and glued together.” “As the figurative mountain pierces the sky, so the criminal career of ‘Babylon the great’ arises before God, calling for retribution.” In other words “She has filled up the measure of her guilt, and destruction is about to fall upon her” which is the reward spoken of beginning in the next verse. Therefore, at this point, “God’s long-suffering is about to end and His judgment upon mystical Babylon about to be executed.” Probation is about to close, not only for “Babylon the great” in specific, but for the world in general when Jesus takes “the censer” and fills it completely “with fire . . . and cast[s] it into the earth” (Revelation 8:5). Likewise, the “two witnesses, two olive trees, and the two candlesticks” (Revelation 11:3,4) will have finished their “testimony” (Revelation 11:7). This final call is to “worship him that made heaven, and the earth, and the sea, and the fountains of waters” (Revelation 14:7) instead of the sea “beast” that “all that dwell upon the earth shall worship . . . whose name are not written in the book of life . . .” (Revelation 13:8). This is when Jesus, “one . . . like unto the Son of man” takes His place on the great “white cloud . 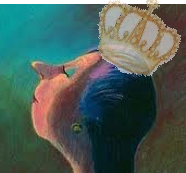 . . having on his head a golden crown, and in his hand a sharp sickle” (Revelation 14:14). Verse 6: Reward her even as she rewarded you, and double unto her double according to her works: in the cup which she hath filled fill to her double. This injunction belonging to the “voice from heaven,” in verse 4 identifying those still in Babylon to be “my people,” appears to be telling the saints to take up the sword of vengeance and administer it themselves. But, as Paul reminded his followers: “Recompense to no man evil for evil” and “avenge not yourselves, but rather give place unto wrath: for it is written, Vengeance is mine; I will repay, saith the Lord” (Romans 12:17, 19). Matthew, remembering the same incident, quotes Jesus saying: “Put up again thy sword into his place: for all they that take the sword shall perish with the sword” (Matthew 26:51, 52). A short time later when He was led into Pilate’s judgment hall “Jesus answered, My kingdom is not of this world: if my kingdom were of this world, then would my servants fight, that I should not be delivered to the Jews: but now is my kingdom not from hence” (John 8:36). Therefore, “Say not thou, I will recompense evil; but wait on the LORD, and he shall save thee” (Proverbs 20:22). He will “judge and avenge our blood on them that dwell on the earth” (Revelation 6:10). Then, “Babylon the great” will learn “It is a fearful thing to fall into the hands of the living God” (Hebrews 10:31). Even though she will suffer at the hands of “the ten [pagan] kings” who “shall make her desolate and naked, and shall eat her flesh, and burn her with fire” it will be “God [who will] put into their hearts to fulfil his will . . .” (Revelation 17:16, 17). Therefore, her doubled reward first destroys her “seat” in the Vatican, then, at the end of the “seven last plagues,” the entire system when “the great city was divided into three parts” (Revelation 16:19). Nevertheless, during the time of their passive resistance during post probationary time, the saints, being mindful of the things taking place, will cry “with a loud voice to him that sat on the cloud, thrust in thy sickle and reap; for the time is come for thee to reap; for the harvest of the earth is ripe” (Revelation 14:15). Verse 7: How much she hath glorified herself, and lived deliciously, so much torment and sorrow give her: for she saith in her heart, I sit a queen, and am no widow, and shall see no sorrow. She did not forget the lesion of the past when she sustained the “deadly wound” (Revelation 13:3; Daniel 11:26) after “the ships of Chittim [came] against him [her]” (Daniel 11:30)  during Reformation times. That experience, instead of bringing repentance and reformation, was resented and she held terrible “indignation against the holy covenant” (Daniel 11:28, 30). Consequently, she became a figurative “widow” because of the death of her former royal lovers who previously acknowledged her authority to authenticate their power as rulers of the nations. Napoleon, who snatched his crown from the hand of the pope during his coronation, changed all that. Therefore, having restored relations with “them that [forsook] the holy covenant,” (Daniel 11:30) when “tiding out of the east and out of the north” reached her ear during the loud cry, she went “fourth with great fury to destroy, and utterly to make away many” (Daniel 11:44) of the “saints . . . and the martyrs of Jesus” (Revelation 17:6) who refused to worship this beast or receive her “mark in the right hand, or in their foreheads” (Revelation 20:4). She felt impelled to lash out with full vigor because she believed to the very core of “her heart” she was never again to be “a queen” and never again “see [the] sorrow” she experienced during the Reformation, and especially in 1798 when “they that [fed] of the portion of [her] meat [destroyed her/him], and [her/his] army” vanished (Daniel 11:26). At the time of this writing, more than 200 years have slipped by since that fall in 1798. With success attending her every step of the way especially since 1929, she has begun to “exalt [her]self, and magnify [her]self till the indignation be accomplished: for that that is determined shall be done” (Daniel 11:36). She has only one object in mind: to regain the lost glory she enjoyed during the Dark Age of history when her “noon . . . was the midnight of the world.” As far as she is concerned, and judging by how things have been going, there is no reason for her to believe she will not fully achieve her goal resulting in the future Dark Age for the world. Her success is prophesied to be such that he/she will “have accomplished to scatter the power of the holy people . . .” (Daniel 12:7). Verse 8: Therefore shall her plagues come in one day, death, and mourning, and famine; and she shall be utterly burned with fire: for strong is the Lord God who judgeth her. While the “seven last plagues” of chapter 16 probably last several days when “the rest of the beasts . . . had their dominion taken away: yet their lives were prolonged for a season and time” (Daniel 7:12) , the woman’s “plagues,” consisting of “death, and mourning, and famine” and “fire,” lasts only “one day” or at least a much shorter period of time. 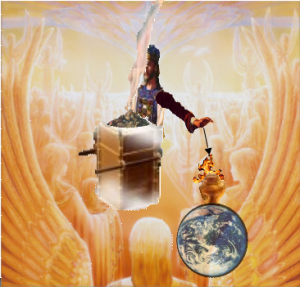 However, knowing that the trumpet scenario, following in sequence with the casting down of the “censer” (Revelation 8:5) signaling the release of the “four winds of the earth” (Revelation 7:1) and causing the “earth, sea” and “trees” to be hurt (Revelation 7:2; 8:7, 8), there is no need to have any reservations about the future application of the trumpets including the fiery scenario of the second. 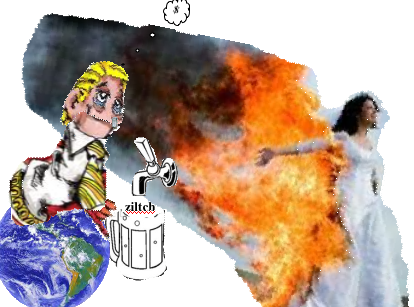 Additionally, the “burning flame” that destroys the “little horn” power after it becomes “the beast” in Dan.7:11 is further confirmatory evidence of the literalness of this future, trumpet catastrophe. So, in spite of the woman’s self aggrandizement in verse 7, boasting that she sits “a queen, and . . . shall see no sorrow,” this ghastly event proves, in only “one day” that God “who judgeth her” is far stronger. These “kings” cannot be the “ten kings” of ch.17 for they enjoyed “power as kings [only] one hour with the [demonic] beast” while these lived “deliciously with” the “MOTHER OF HARLOTS” (Revelation 17:5) much longer while they were committing “fornication” with “the great whore that sitteth upon many waters,” (Revelation 17:1) at least since 1798. Now while viewing the actual “smoke of her burning” their crying and lamenting suggest they loved her dearly while the “ten” short term, pagan “kings” must have hated the “whore” right from the start. The love affair of these earthly kings with Babylon the Great could be due to them having been able to survive economic disaster because of their adulterous relationship with her. Now, bankruptcy faces them once again. Note again that the “vile person,” who parallels Babylon in this chapter, causes the “strong holds “to rule over many, and shall divide the land for gain” (Daniel 11:21, 39) with the “strong holds” being parallel to “the kings of the earth” in this chapter. Evidently, they will lose their power when he/she is destroyed although Daniel (except in ch.7:11), says nothing about her/his destruction in that reference. So, how is she/he able to give the “kings of the earth” or the “strong holds” the power “to rule over [the] many”? Note the words “lived deliciously.” They are translated from a single Greek word “streinao” meaning “to be wanton, to live luxuriously.” Such a manner of life, that began when The kings of the earth . . . committed [the] fornication” mentioned in verse 2 which was the placement of “the abomination that maketh desolate” (Daniel 11:31; 12:11), he/she must have satiated them with “the abundance of her” (verse 3) wealth freeing them from their economic woes. Little wonder they mourn her demise. Verse 10: Standing afar off for the fear of her torment, saying, Alas, alas, that great city Babylon, that mighty city! for in one hour is thy judgment come. Do they stand “afar off” because they are cowards or just plain common sense? I suggest the later. One of the most feared disasters of current history is radiation hazard. The melt down of the Russian nuclear reactor in Chernobyl is a prime example. The only protection available to the surrounding community was rapid evacuation and to stand “afar off” as possible. 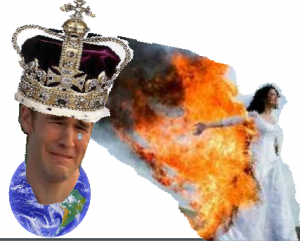 It seems likely the same holds for the “kings of the earth” who dare not approach the site of her “burning” for fear of exposing themselves to its deadly radiation! Their sorrow is for selfish reasons. Evidently the power of their rule was greatly augmented by linking hands with the “woman” instead of the “beast” even though their relationship with the beast, who gave the “woman,” her “power, seat, and great authority” (Revelation 13:2), was real, although indirectly. According to one view the “’merchants’ are the literal commercial and business leaders of the earth” and the “’merchandise” as “literal articles of manufacture and trade.” While the Commentary favors a “highly figurative” interpretation, I see the context strongly favoring the literal. This takes us back to Daniel 11:39 where the “vile person . . . shall divide the land for gain” (Daniel 11:39). As we learned there, this is when “he,” the “vile person,” will disenfranchise all who refuse “his” identifying “mark” called “the abomination that maketh desolate” (Daniel 11:31; 12:11). One of his means of enforcement is through “spoil,” the same penalty administered during the historic dark age when “he shall scatter [or distribute among them the prey, and spoil, and riches” (Daniel 11:24), and during the future dark age when he will use the same technique by afflicting those who resist him through “spoil” as well as by “sword, flame” and “captivity” (Daniel 11:33). In other words, all who resist the “image” and the “mark,” as portrayed in Revelation 13:16 and 17 or “the abomination” (Daniel 11:31; 12:11), will, not only face the threat of death and imprisonment, but will also have their goods confiscated. This will be a golden opportunity for “the merchants of the earth” who will eagerly seize those goods and sell them to the Vatican who will buy them, probably at the inflated prices demanded by the “merchants of the earth.” The woman’s destruction brings that traffic to a halt. This gives us some insight into the numbers of the population of “the land” that will refuse to cooperate with the “woman” and the “abundance” of her wealth. Since the “merchants of the earth are waxed rich though the abundance of her delicacies” there must have been a very great number of people who had their goods confiscated for refusing the “image and the “mark,” and the “woman” herself must be very wealthy in order to be able to pay the “merchants” what they demanded. So, who are the people who allowed their good to be confiscated? Obviously, the “great multitude, which no man could number, of all nations, and kindreds, and people, and tongues” who “came out of great tribulation” (Revelation 7:9, 14), during which time they were threatened with “fire, sword, captivity” as well as by “spoil” depicted in Daniel 11:33. Verses 12 & 13: The merchandise of gold, and silver, and precious stones, and of pearls, and fine linen, and purple, and silk, and scarlet, and all thyine wood, and all manner vessels of ivory, and all manner vessels of most precious wood, and of brass, and iron, and marble, And cinnamon, and odours, and ointments, and frankincense, and wine, and oil, and fine flour, and wheat, and beasts, and sheep, and horses, and chariots, and slaves, and souls of men. I agree with the Commentary that decries any effort “to draw some hidden meaning from” “the 28 items of traded listed” in these verses, because the meaning is clear. While the Commentary asserts that the “character of ch.18” is “highly diffuse and poetic,” I, with all due respect, see it as highly specific and literal for goods that are deemed valuable. It is a revelation of the Vatican’s truly astonishing wealth which probably surpasses all that the mind can imagine. According to what John saw when “the heaven departed as a scroll . . . and every mountains island were moved out of their places,” among the others who witnessed the coming “of him that sitteth on the throne” at the time of “the great day of his wrath” were “bondman” (Revelation 6: 15, 17) or slaves denoting the fact that slavery will be very much alive at the time of the second coming. But, while “slaves,” or bodies can be confiscated, captured, stolen, and resold, marketing the “souls of men” is another matter. Consequently, it must be the “merchants” who indulge in such traffic really sells his own “soul” to the Devil! Even though they are able to escape the fire “of her burning,” their doom is no less certain. But, where did the “merchants” obtain enough of these things to enable them to wax “rich?” Doubtless, the source comes from the possessions of “both small, and great, rich and poor, free and bond” who refused to “worship the image of the beast” (Revelation 20:4). While some were able to seek refuge in solitary places, imprisoned and “killed,” the possessions of all must have been confiscated by their neighbors, sold to the “merchants of the earth” then resold to the Vatican. Obviously, having secured enough of those stolen items to make those numerous “merchants . . . rich,” suggests that a “great multitude, which no man could number . . . which came out of [the] great tribulation” (Revelation 7:9,14) will be willing to accept the sacrifice of all their goods and take their stand on the Lord’s side. Verse 14: And the fruits that thy soul lusted after are departed from thee, and all things which were dainty and goodly are departed from thee, and thou shalt find them no more at all. With the exception of the “wine, oil, flour, wheat, beasts, sheep and horses” in the list of verses 12 and 13, most of the items were inedible. This lists the items the “woman” particularly “lusted after . . . which” she considered “dainty and goodly.” Evidently, they are edible things consisting of “fruits,” or more specifically, ‘the season of ripe fruits,’ in late summer or early autumn.” Note the lack of reference to flesh food, which is surprising. Nevertheless, the list is suggestive of gluttonous, self-indulgence and decadence. Note the phrase “no more at all” used six times in verses 14, 21, 22 and 23 depicting her descent into “perdition,” even before the “beast that . . . was, and is not” (Revelation 17:11). This means her “judgment” (Revelation 17:1) is final, not unlike “the second death” alluded to in ch.2:11; 20:6, 14; and 21:8 although this scenario occurs during pre millennial time while the “second death” occurs during post millennial time. Verses 15, 16, 17 (first part): The merchants of these things, which were made rich by her, shall stand afar off for the fear of her torment, weeping and wailing, And saying, Alas, alas, that great city, that was clothed in fine linen, and purple, and scarlet, and decked with gold, and precious stones, and pearls! For in one hour so great riches is come to nought. With so much time devoted to the matter of the “merchants (see verses 3,11,15,16, the first part of 17 and even a part of verse 23),” one has to wonder if this scenario is actually depicting the despair caused by the “national ruin” predicted to follow after “Protestant American [has] formed an image to the papacy,” ending in “a national apostasy . . .” No business can prosper without a market. The effect of “national ruin” may trigger a depression unlike any other experienced by any other nation! Because of a ripple effect, it could initiate an economic melt-down felt, not only by the nation, but spreading globally because these are the “merchants of [all] the earth” (see verse 11) not just the United States. Another possibility is that the economic sanction (Revelation 13:17) imposed on those who refused the “mark” during probationary time, caused the shut down of many business enterprises in America upon which its infrastructure was based. As a result, it quickly led to the “national ruin” specified. Instead of lifting the sanction in order to reverse the trend, the illicit market established by Rome was set up giving incentive to the “merchants of the earth” to buy all the confiscated goods they could lay their hand on and sell them to Rome for a rich profit. Such a scenario would engender a “feeding frenzy” impossible to stop short of total, economic collapse. How could the business world, operated by men who live in the “real world” and use common sense to make their decisions, ever fall into such a destructive tail-spin? The only answer is that “the kings of the earth . . . and the inhabitants of the earth” and “all nations” will “have been made drunk with the wine of her fornication” (Revelation 17:2; 18:3). Simple greed, coupled with the specter of future riches to prevent impoverishment, overpowers their better judgment. Note, just like the “kings of the earth” who are seen “standing afar off for fear of her torment,” the “merchants of these things” also “stand afar off,” ostensibly for fear of radiation hazard. Verses 17 (last part), 18, 19: And every shipmaster, and all the company in ships, and sailors, and as many as trade by sea, stood afar off, And cried when they saw the smoke of her burning, saying, What city is like unto this great city! And they cast dust on their heads, and cried, weeping and wailing, saying, Alas, alas, that great city, wherein were made rich all that had ships in the sea by reason of her costliness! for in one hour is she made desolate. Without understanding the future setting of the trumpet scenario beginning in chapter 8 verse 7, these verses seem strangely out of place. Although the Commentary insists this is still “highly figurative language,” it correctly defines “shipmaster, company in ships, trade by sea” in very literal terms. That point alone argues for a literal application. Notice the twice mentioned “ships” in verses 17 and 19 and compare the parallel “ships” in Revelation 8:9 where, after “the second angel sounded” his trumpet, “the third part of the ships were destroyed.” Without doubt, those are the same “ships” depicted here in chapter 18. Doubtless, also, such a catastrophe would cause great sorrow among the shipmasters, company in ships and the sailors who operate them. But, that is not their only loss. Even though we can assume two thirds of their “ships” were left intact, the same market that the “merchants of the earth” had just lost, was now also gone for the sea faring men. They now allude to the fact there is no other “city” in the world “like unto this great city!” In other words, there are no other buyers for the illicit “merchandise” depicted in verses 12 to 14 that they were transporting to Vatican city because that “city,” who has been adding to her treasure for centuries, is thus “by reason of her costliness” is the wealthiest in the world and was well able to finance this illicit traffic. The prosperity resulting to the “merchants of the earth . . . shipmaster, sailors” and sea traders, should be considered additional, evidence for the large number of people who refuse submission to the “beast, his image” and “his mark” and were willing to forsake their possessions in order to preserve freedom of worship. “And it shall come to pass, that in all the land, saith the LORD, two parts therein shall be cut off and die; but the third shall be left therein. And I will bring the third part through the fire, and will refine them as silver is refined, and will try them as gold is tried; they shall call on my name, and I will hear them: I will say, It is my people: and they shall say, The LORD is my God” (Zechariah 13:8,9). Even though a “third” seems relatively small, one third of six billion, is still a very large number of people whose confiscated goods became a gold mine for the “merchants of the earth” and the sea faring men. Verse 20: Rejoice over her, thou heaven, and ye holy apostles and prophets; for God hath avenged you on her. The joy expressed here is in stark contrast to the grief displayed by the “kings of the earth, merchants of the earth” and the sea faring men of verses 9, 11 and 17. Since this scene is in context with the event that occurred during the second trumpet of Revelation 8:8,9, these “holy apostles and prophets,” along with the heavenly, angelic host, will have manifested their joy prior to the rescued saints who “had gotten the victory over the beast” in Revelation 15:2 and the 144,000 pictured standing on “Mount Sion” in Revelation 14:1. In other words, it will have taken place prior to the second coming which must have preceded them. So, in this verse, the invitation to “rejoice” is extended to those in “heaven,” and the “holy apostles and prophets” who are “more likely, those of OT times.” Who then, are these people? Quite likely, they are “the saints which slept” and “arose” when their “graves were opened” just after Jesus died on the cross in Matthew 27:59. They “were raised to everlasting life” and “ascended with [Jesus] as trophies of His victory over death and the grave.” Other examples of “apostles and prophets” are Enoch, Moses and Elijah who were taken to heaven long before Christ’s resurrection. But, none of those people had direct contact with the “great whore” who arose some 500 years after Christ’s resurrection. So, in what sense could it be said that they are “avenged” by the death of the “great whore”? Even though they were in heaven, safe from direct contact with her, they suffered right along with God’s people on earth as they watched her atrocious behavior, and suffering she inflicted for 1260 long years during the historic Dark Age, and especially during the future Dark Age when she became “drunken with the blood of the saints, and with the blood of the martyrs of Jesus” (Revelation 17:6) for refusing to worship “the beast, neither his image, neither [to receive] his mark upon their foreheads, or in their hands” (Revelation 20:4). It must have been agony for the heavenly watchers. So, lack of direct contact and being immortal did not spare them the stress of empathy. Their great joy at seeing the destruction of the “whore” can be readily understood from that perspective. Verse 21: And a mighty angel took up a stone like a great millstone, and cast it into the sea, saying, Thus with violence shall that great city Babylon be thrown down, and shall be found no more at all. Therefore, this “mighty angel” is demonstrating what is to take place during the second trumpet scenario of Revelation 8:8,9. When his figurative “millstone” strikes the “sea,” he leaves it up to the imagination to visualize the resulting tsunami destroying “the third part of the ships.” That, in turn causes the great grief expressed by “every shipmaster, and all the company in ships, and sailors, and as many as trade by sea” (verse 17). Therefore, this angel demonstrates, in symbolic manner, that which is to take place literally, reinforcing the fact that: “The teachings of this book are definite, not mystical and unintelligible.” The second trumpet episode is very definite! But, Rome is some thirty miles inland from the sea. 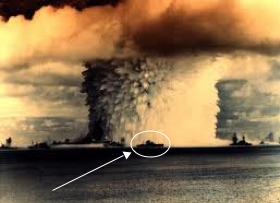 How could its destruction also involve the destruction of sea going vessels, especially such a large number of them? 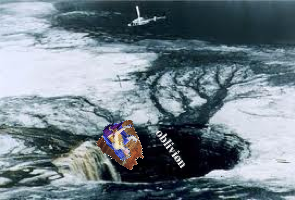 If we accept the premise that the great millstone, that the angel thrust into the sea, is intended to demonstrate a literal event, a great tsunami would be generated which would scuttle every floating object in its path. 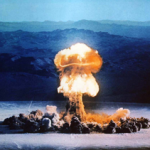 In light of present day technology, such a catastrophe could well be caused by atomic weaponry, inconceivable just a few years ago, but very possible, even likely today. 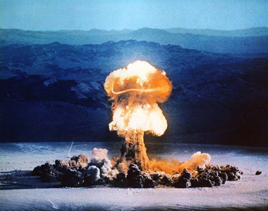 The enormity of destruction possible with one atomic or hydrogen warhead is nearly unlimited. Multiple warheads sent against the surrounding countryside could easily involve the Mediterranean sea and all the cargo ships that happen to be present. The thirty or so miles of separation between the city and the sea would not protect the sailors and shipmasters who were manning the ships, only the owners who were standing “afar off” in their home ports somewhere else in the world except those bordering the Tyrrhenian sea. Its remarks about the “One day.” of verse 8 that should be understood as “a point –rather than a period—of time, and thus appear to stress suddenness and unexpectedness rather than duration” certainly have application to the angel’s demonstration in verses 21 to 24 as well. Verses 22, 23: And the voice of harpers, and musicians, and of pipers, and trumpeters, shall be heard no more at all in thee; and no craftsman, of whatsoever craft he be, shall be found any more in thee; and the sound of a millstone shall be heard no more at all in thee; And the light of a candle shall shine no more at all in thee; and the voice of the bridegroom and of the bride shall be heard no more at all in thee: for thy merchants were the great men of the earth; for by thy sorceries were all nations deceived. Note the repetition of the phrase “nor more at all” (verses 14, 21, 22 & 23 for a total of six times) emphasizing absolute finality. It was first spoken by the grief stricken “merchants of the earth” after listing all the good things they were deprived of with no thought of the crimes committed by the “whore.” But, the angel is gratified, being fully aware of her despicable past. But, as these verses indicate, she could not care less about her past. Instead, “she hath glorified herself, and lived deliciously” saying “in her heart, I sit a queen, and am no widow, and shall see no sorrow” (verse 7), a mini repetition of the “days that were before the flood [when] they were eating and drinking, marrying and giving in marriage . . . And knew not until the flood came, and took them all away” (Matthew 24:38, 39). Her fate, illustrated by this enormous pit into which she is cast, will be shared by the “angel of the bottomless pit whose name in the Hebrew tongue is Abaddon, but in the Greek tongue hath his name Apollyon” (Revelation 9:11) including all “whose names are not written in the book of life of the Lamb slain from the foundation of the earth” (Revelation 13:8) sometime later. Her destruction, coming during the “second trumpet” scenario precedes theirs. Verse 24: And in her was found the blood of prophets, and of saints, and of all that were slain upon the earth. The Commentary remarks: “Mystical Babylon represents apostate religion since the beginning of time.” That concept harmonizes well with the “horse that was red,” representing the “synagogue of Satan” who “say they are Jews [in the spiritual sense] but are not, but do lie” (see Revelation 6:4; 2:9; 3:9). Summary of chapter 18: Like all the rest of the chapters of Revelation, this too must be viewed in context with the preceding which left us with a reference to “the woman . . . that great city” namely “Rome, the haughty see” representative of the Vatican, which ended up being burned “with fire” in verse 16 during the post probationary second trumpet scenario of Revelation 8:8,9. While the opening of this chapter portrays the probationary time of the loud cry warning God’s people to escape from her as a system of false beliefs, the great body of this chapter beginning in verse 5 describes the lament of three chief characters who witness her fiery demise as a literal city. They are the “kings of the earth, merchants of the earth” and the sea farers all of whom were profited by the Vatican while she was alive. 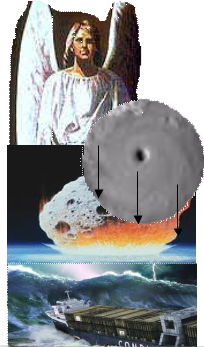 In the attempt to understand the nature of the suddenness and violence connected with her destruction, we are left with only two choices: (1) a direct action of God Himself or (2) an indirection action of the ten pagan kings of Revelation 17:12, 16, 17, who, it seems used atomic weapons to accomplish their purpose. Although the word “power” in the KJV is supplied, the sentence in Revelation 11:3 would be incomplete without it. In the hard copy of the Great Controversy page 266 (second paragraph) reads: “The holy city shall they tread under foot forty and two months.” But, the same phrase in the CDROM and Spirit of Prophecy Vol.4 page 188 reads: “The holy city [the true church] shall they tread under foot forty and two months.” Therefore, the bracketed phrase which interprets “the holy city” is missing for some reason in the hard copy. Note the mentions of “them that dwell on the earth” in Revelation 6:10; 13:14; 14:6; 17:8. With the exception of ch.14:6, their spiritual condition appears hopeless. Even though the “woman” of ch.17 is specifically named “BABYLON THE GREAT,” “Babylon the great” here must include, not only “THE MOTHER,” but also her daughter “HARLOTS.” Therefore: “The message of Revelation 14, announcing the fall of Babylon must apply to religious bodies that were once pure and have become corrupt. Since this message follows the warning of the judgment, it must be given in the last days; therefore it cannot refer to the Roman Church alone, for that church has been in a fallen condition for many centuries.” (GC 382) Therefore, the message of chapter 18 must also apply to both parties. 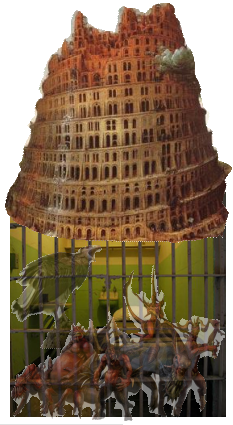 Nevertheless, “Babylon the great” is a specific reference to the Vatican in ch.17:5 who, by this time has become “the habitation of devils, and the hold of every foul spirit, and a cage of every unclean and hateful bird.” These words vividly describe the spiritual condition of things prevailing in the Vatican right now. They bring conformation to the words of Archbishop Emmanuel Milingo “a formerly high-ranking cleric who first spoke out about Satanism in the Vatican, and took a lot of heat for it.” He goes on to say: “The devil in the Catholic Church is so protected now that he is like an animal protected by the government; put in a game preserve that outlaws anyone, especially hunters, from trying to capture or kill it. The devil within the Church today is actually protected by certain Church authorities from the official devil-hunter in the Church—the exorcist. So much so that the exorcist today is forbidden to attack the devil. The devil is so protected that the one who is the hunter, the exorcist, is forbidden to do his job.” (see <http://www.theharrowing.com/devil.html.>) Correspondingly, it should be no surprise that pedophilia, one of the sins recently given wide exposure by the press, seems engrained in the psyche of the clerics. Interestingly, nothing is said about a “fourth angel” in the Spirit of Prophecy, while we find a “fourth angel” in Revelation 8:12 who bears the fourth trumpet, and in 16:8 where a “fourth angel” bears the “fourth plague.” Therefore, it is probably better to refrain from using that confusing terminology because this “angel” is neither of those. “delicacies” from: “strnos” (Strong’s #4764) “excessive strength which longs to break forth, luxury, eager desire” Interestingly, this is the only place this word us used in the New Testament. In verse 11, her “delicacies” are called “merchandise” from: “gamos” (Strong’s #1117) meaning “cargo, lading or freight of a ship, any merchandise” obviously literal. See note #11 above. 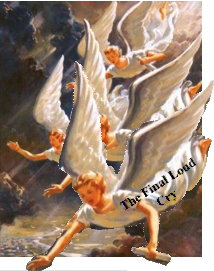 As with the ostensible “fourth angel,” there are two “fifth angel’s.” In Revelation 9:1 we find the “fifth” trumpet bearing “angel”, and in Revelation 16:10 a “fifth” plague bearing “angel” are depicted. But the other “angel” of Revelation 18:4 is neither of those because he is inviting people to escape the plagues that begin when the trumpet is sounded and the vial is poured out. But, of course, God who is no respecter of persons (Acts 10:34; Romans 2:11; Ephesians 6:9; Col.3:25) will not close probation arbitrarily. It will close only when He sees that all have made their final irrevocable decision. Only God can decide when that point has been reached. see Great Controversy 604: “Of Babylon, at the time brought to view in this prophecy, it is declared, ‘Her sins have reached unto heaven, and God hath remembered her iniquities.’ [REV. 18:5.] She has filled up the measure of her guilt, and destruction is about to fall upon her. 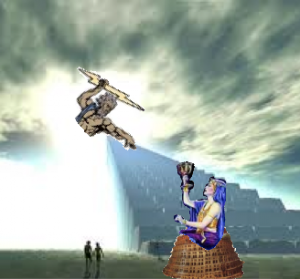 But God still has a people in Babylon; and before the visitation of his judgments, these faithful ones must be called out, that they ‘partake not of her sins, and receive not of her plagues.’ Hence the movement symbolized by the angel coming down from Heaven, lightening the earth with his glory, and crying mightily with a strong voice, announcing the sins of Babylon. In connection with his message the call is heard, ‘Come out of her, my people.’ These announcements, uniting with the third angel’s message, constitute the final warning to be given to the inhabitants of the earth. Although the “great whore” in Revelation 17 and 18 is in the female gender and the “vile person” in Daniel 11:21-45 is male, close study reveals them to be parallel symbols. Note that the woman’s parallel is the sea beast of Revelation 13:1-10. It is male with the pronouns “his, him,” and “he” being used repeatedly. According to this account, snatching the crown might not be quite right: “The common, malicious story, (apparently started by the Duchess d’Abrantes in her Memoirs) that Napoleon grabbed the crown from the Pope and crowned himself does not agree with the careful plans for the ceremony. Napoleon planned all along to avoid accepting the Pope as his overlord. Pope Pius VII, a practical man, agreed to the order of ceremony negotiated by Cardinal Papal legate G.B. Caprara in exchange for regaining several papal territories and a chance to visit France with the hope of winning the French people back to the Catholic church. see SDA Bible Commentary Vol.7, page 863 (left column under “Famine.”) Be aware that I reorganized the wording to make it more understandable, at least for me! “utterly burned” is from: “katakaio” (Strong’s #2618) “burn, burn up burn utterly. It is used 12 times in the NT. For example Matt.3:12 “burn up the chaff with unquenchable fire; also Matthew 13:30; Luke 3:17’ Hebrews 13:11; 2 Peter 3:10 all appear to be literal fires. Remember, the “whore” did not become a “mother” until the daughter “harlots” materialized. That could not have happened prior to 1798, perhaps even 1844 before Protestentism began to apostatise. Note even though the feminine gender is frequently used in chapter 18 the same organization is depicted in the masculine gender in Revelation 13, as well as all the other references to it, inclusive of Daniel 7, 8 and 11. The word “spoil” is from the Hebrew word “bizzah” (Strong’s #961) meaning “spoil” or “booty” that is goods that are stolen in the illegal sense, or confiscated in the legal sense. we have no way of knowing if these bodies are alive or dead. Quite possibly, it could even refer to body parts salvaged from those who were executed in the pogram depicted in Rev.20:4! See SDA Bible Commentary Vol.7, page 865 (left column under “Shipmaster., All company in ships., and “Trade by sea.”) Note that “Shipmaster means “the officer in charge of navigating a ship . 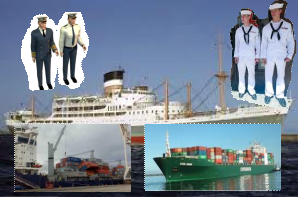 . . every ships’ captain taking his ship from one port to another . . . work the sea, that is , obtain a living from the sea . . . occupations as shipbuilding, fishing . . . etc.” This is very literal language. Its a struggle to cast these figures into a symbolic mode! “costliness” from: “timiotes” (Strong’s #5094) “preciousness, costliness, an abundance of costly things, expensiveness, magnificence;” metaphorically: “worth, excellence.” This is the only time this word is used. according to an estimate in the Wikipedia free encyclopedia, 6 billion was reached in 1999. It is expected to reach 8 billion by 2028! Could the term “mystical Babylon” be an example of a “mystical” interpretation here? see Daniel and the Revelation, by Uriah Smith page 729 were verses 20-24 are quoted with very little elaboration except that “Babylon sinks to rise no more” without suggesting how it could happen. This is understandable, of course. See SDA Bible Commentary Vol.7, page 866 It says nothing about a possible tsunami neither does it suggest a reason for the kings, merchants and seamen to stand “afar off.” Although an atomic explosion might seem ludicrous, the possibility of just such an event becomes much more likely in the light of ongoing current events!